Five years ago, Catherine and Temple Pond led a seemingly picturesque New England life in the small New Hampshire village of Hancock. Their Federal-style home, built in 1813, had been passed down through the Pond family for generations. But as the collection of antiques and heirlooms grew, so did the weight of history. The couple finally decided it was time to shift that burden off their own family: They moved to Kentucky to start a new, simpler legacy. Catherine, 51, and Temple, 58, met in Catherine's grandparents' hayfield and had always wanted a farm of their own. But after marrying in 1996, they moved into Temple's family home in historic downtown Hancock and put on hold their dreams of raising cattle and growing their own food. For many years, Catherine worked as a freelance writer and museum site manager, while Temple cut and sold timber. They shared a passion for filling their house with paintings, furniture and Asian artifacts in addition to their family photos, archives and heirlooms. "In many ways it was like living in a museum," Catherine told The Huffington Post. "We had the stuff of generations from both of our families. We weren't hoarders, but we were amassing this family legacy." 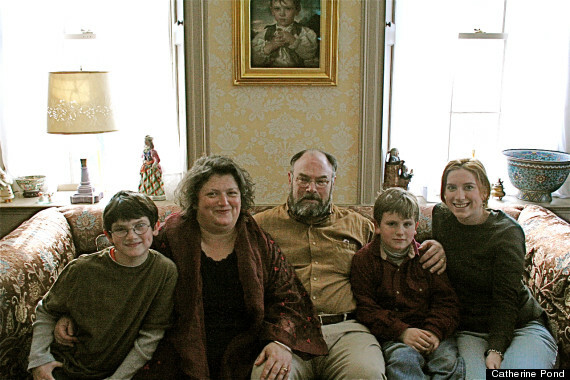 The Pond family in the front parlor of their Hancock home in December 2007. From left: Henry (now 16), Catherine (now 51), Temple (now 58), Eli (now 14) and Addie (now 26 and living in Colorado). Over time, the Ponds felt more and more burdened by their possessions and yearned for the freedom of broad pastures and less stuff. In the early 2000s a somber coincidence spurred them to action. Catherine's and Temple's fathers passed away within a year of each other, and they decided it was time to finally carry out their plans. "We started thinking more that we could really live our own lives," Catherine said. "We asked ourselves, 'How would we want to live them?'" The answer was clear: They bought a farm. But instead of bringing the happiness they had anticipated, the purchase only brought more problems. They had bought the family farm a few towns south -- the same one where they had met -- from Catherine's mother, and the transaction unearthed old issues and inflamed tensions within the family. "It became very contentious," Catherine said. "It was its own burden to even think of living there." The couple realized that the only way to truly simplify their lives was to start completely fresh, so in 2008 the Pond family moved nearly 1,000 miles away to a small house on 250 acres in Nancy, Kentucky. They sold some family items, but most of the photos and archives ended up in storage. They are still working through the collection, doing their best to decide what's important and what can be discarded. "As you get older, you start to question whether you really need all of this stuff," Catherine said. "It's amazing what you can give up and do without that you thought you needed." Henry (in foreground) and Temple and Eli (in background) wind up a full week of haying in June 2014. Both boys have been operating farm equipment for a few years now. The small cottage they live in sits on an 8-mile ridge in southern Kentucky, surrounded by rolling, grassy hills. They have about 200 cows, 10 ewes, seven baby lambs, chickens and a variety of other farm animals, including a 3-year-old bull named Edgar, who has received a "stay of execution," Catherine said. She has loved seeing their sons -- Henry, 16, and Eli, 14 -- take to farm life, working hard and shouldering responsibility for more than they had before. She describes Eli as "a general animal-whisperer" and Henry as "our tractor guy." Their daughter, Addie, 26, works in Colorado but helps out when she visits. Catherine still writes regularly and is at work on a farm-related memoir about their journey, while Temple, "a confirmed Luddite who doesn't use the computer much," labors full-time on the farm. Living out in the country has given them more distance from their nearest neighbors. "Here I value our space and sense of open land," Catherine said. "[Before] it was rather like living in a gilded cage: We were right in the center of the village where we had no privacy." Despite the distance (or perhaps because of it), the Ponds have grown close to the other families on their ridge -- including a community of Old Order Mennonites in the next county whose "more basic lifestyle, which focuses on values rather than things," has inspired the Ponds, Catherine said. The Ponds' Old Order Mennonite neighbors gather at lunch during the building of the hay shed. After six years of farm life, Catherine feels her family is finally living the life they were meant to live. She is grateful for the peace and contentment they missed in their previous life. "We were more slaves to our own house, in a way. There was this image that we felt we had to maintain with protecting and preserving everything," she said. "I loved the house, but it was so freeing for both of us to come here. It's hard to grow up in a museum, really."